PowerShot G6 captures an amazing 7.1 megapixels of resolution to give even your largest prints rich, smooth detail and color. The CCD is optimized by a new optical system for superb image clarity. A new, ergonomically designed grip evokes the traditional comfort and secure hold of an SLR camera. Canon's exclusive DIGIC Image Processor revolutionized how you shoot digital by allowing the camera to process images faster and improving the accuracy of the autofocus. DIGIC also reduces the effects on noise in your images. iSAPS Technology is an entirely new scene-recognition technology developed for digital cameras by Canon. Using an internal database of thousands of different photos, iSAPS works with the fast DIGIC Image Processor to improve focus speed and accuracy, as well as exposure and white balance. 9-point AiAF gives you unlimited flexibility in framing your shots your way. The system ensures that even far off-center subjects will be quickly and accurately focused. The camera's numerous shooting modes will satisfy both beginners and advanced photographers. Everyday shooting situations are made easy with preset parameters, and creativity is encouraged with plenty of flexibility for the user control. 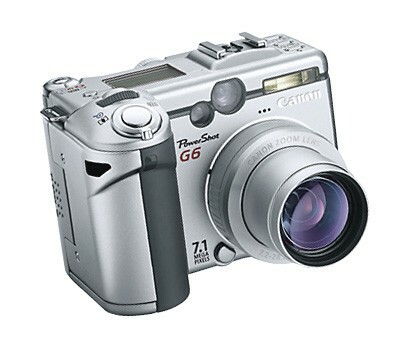 PowerShot G6 lets you record smooth VGA-quality movies (640 x 480 pixels at 10 frames / second) up to 30 seconds long. Two additional movie quality modes are also available. ID Photo Print is a great convenience, offering an easy way to create ID photos in 28 sizes to match typical ID-photo requirements for many countries. Movie Print lets you print multiple, successive stills from a recorded movie on a single sheet. The number of stills printed is automatically chosen to correspond with the paper size. Focusing Range: <?xml:namespace prefix = st1 ns = "urn:schemas-microsoft-com:office:smarttags" />Normal AF: 50cm/20 in. - InfinityMacro AF: 5-50cm/2.0-20 in. Self-Timer: Operates with approx. 2 sec. or approx 10 sec. count-down. Continuous Shooting: High Speed Approx. 11 shots/sec. Total length of movie files recordable on specific CF cards; Individual 640 x 480 movie clips are limited to 30 seconds maximum per clip; individual 320 x 240 and 160 x 120 movie clips are limited to 3 minutes maximum per clip. Approx. 400 minutes (Under Canon's standard conditions with fully charged battery) Canon's standard conditions of measuring shooting capacity are as follows: Normal temperature (23 degrees C). LCD viewfinder is ON. Shoot images at wide angle end and at telephoto end alternately with 20 second intervals. Use flash every 4th shot. Turn camera off and on every 8th shot. Canon's standard conditions of measuring playback time are as follows: Normal temperature (23 degrees C). Repeat playback automatically at a speed of 1 image per 5 seconds.